-- Version 16.3 contains 10 new games, bringing the total number of games to 930. You can download Pretty Good Solitaire version 16.3 from http://www.goodsol.com/download.html . Or, if you have a previous version installed, you can run the game, go to the Internet menu, and select "Download Latest Version". Be sure to exit the game before you install. Pretty Good Solitaire version 16.3 is a free update for those who originally ordered version 14 (ordered after February 9, 2013) or those who paid for an upgrade since that time. However, it is not a free upgrade for those who originally ordered version 13 or earlier. If you registration code begins with "43", "46", "2g", "2d", or "2a", version 16 is a free update. Otherwise, it is not. If your registration code starts with "42" or "2r", version 15 was a free upgrade but version 16 is not. If your code worked in version 16.0, 16.1, or 16.2, it works in 16.3. Full details on upgrading are at http://www.goodsol.com/upgrade.html . 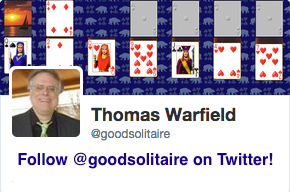 Upgrades are still only US$11.95 and are vital to keep us going to make Pretty Good Solitaire better. Note that we always keep some older versions available at http://www.goodsol.com/downloadpre.html for those who prefer not to upgrade. 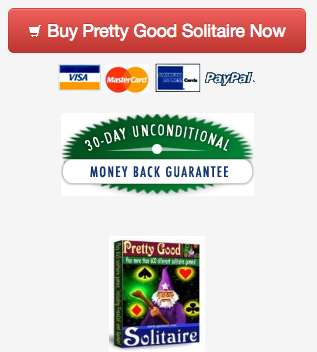 Pretty Good Solitaire version 16.3 is US$24.95 for immediate electronic delivery. If you want an additional CD, there is an option to add $9.95 shipping for a CD. In addition to installing the basic game, the CD also installs all of the currently available extra card sets. You can order online from http://www.goodsol.com/order.html using major credit cards, PayPal, or Amazon payments. - Aces Wild - a variation of Gold Rush where any card can be played on an Ace or an Ace played on any card. - Assembly Rush - a variation of Assembly with redeals. - Australian Spider - an easier variation of Yukon Spider. - Double Nickels - a slightly easier version of Double Fives. - Fifteen Puzzle Cell - the game Fifteen Puzzle with an extra cell. - Forty Eight Thieves - a 12 tableau pile version of Forty Thieves. - Quadruple Harp - a 4 deck version of the Klondike type game Harp. - Runner - an easier version of Acme. - Tower of London - a FreeCell type game similar to Towers. - Yorktown - an all cards in the tableau visible version of Klondike similar to Saratoga. The Christmas Card Set is a card set with Christmas holiday images on the cards. It is available for all our Windows and Mac games. The Christmas Card Set can be downloaded from http://www.goodsol.com/pgs/christmas.html . Both Windows and Mac versions of the card set are available.